Now that I've figured out how to get to chat, I see that there's kind of a lot there. I see all sorts of weird things there. Before I ask about what's appropriate behavior, I'd like to know just how to use all the bells and whistles. What if you make a mistake (how do you edit)? How do you ping someone? How do you reply to a specific comment? What are those items on the right? what about images and videos and tops of web pages? What else is there that I haven't thought of? As you note in your question, it is possible to edit your messages, within a 2 minute window of posting them. There are two method's for editing. The easiest is to push the up arrow key ↑, and that will put your last message in the text box for creating messages. You'll notice that the background of the text box is darker now that you're editing. If the next key you push is ↑, then that will let you edit your message before the one you are editing, so long as you posted it within the 2 minute window. The "edit" option is in the bottom left. If you desperately need your message edited (e.g. you've accidentally put your password in it) and you've left the two minute window, you can flag the message for a moderator (option in the bottom right of the window) and they can make the requisite changes. This isn't the only use for the flag, but we can discuss flagging problem behaviour in another post. The delete option does what you'd expect: delete the message. Deletion has the same time limit as editing, and so you can use the moderator flag for that, too, if need be. The permalink option at the top is a link to the chat transcript, which is a permanent record of what has been said in chat. You can use that to link to your message. If you post a permalink as its own message (without any other text) then the linked message will appear as a quote in the chat window. The number in the text box is the ID of the message you want to reply to. Other things available in the menu, starring and flagging as spam/offensive, are also available on the right of the message. The star is used for, as the title suggests, highlighting interesting things people say. 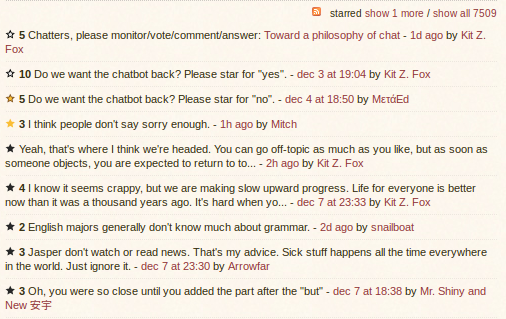 When a message is starred, then it will appear on the starboard at the right of the chat room. 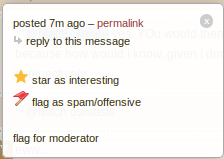 The stars at the top of the board that are outlines, rather than solid, are pinned to the star board, by moderators, because they are particularly important. Things you have starred have yellow stars. As I mentioned before, flagging will be discussed in another post. I think that covers the basic things you can do to a message. You can click on one of the names to autocomplete it, or push tab to autocomplete the first option. The ping will appear in the user's inbox. Pinging another users will only work if they are in the chat room at the time, or have visited recently. The list of users that appear in the autocomplete indicate that these users are pingable. If they do not appear, then they are not pingable. With regard to "tops of web pages", certain websites can have their content "one-boxed", i.e. a summary of what you are linking to is inserted into chat. This only works if you send the URL as the entirety of the message. The list of sites this works for is available here and includes Stack Exchange questions and answers, Wikipedia and Twitter. You can also post URLs to images as their own message and these will be shown as images. 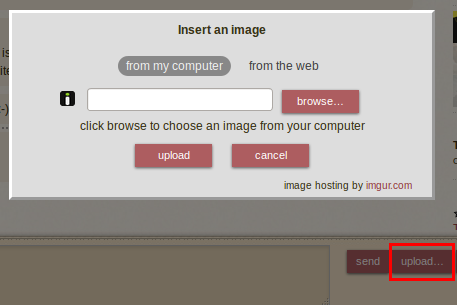 As well as that you can upload image from your computer with the upload button. Images uploaded in this way go to imgur. You can also use this dialogue to take images from a website and save them to imgur, to save on the other website's bandwidth. These are the basics and should get you going. There are other things that can be done, such as viewing all the rooms, creating your own room, reading the transcript and scheduling events, but you'll only want to start doing that once you're up to speed with the basics. Not the answer you're looking for? Browse other questions tagged support faq chat chat-faq . How can I increase the bounty I just posted on this newly reopened question? Chat: How do I get to it? Why can't I edit any questions anymore? Is it a bug or…? How do I invite a user to chat and mentioning user?